Let's dive right in and I'll tell you I did not enjoy this book and found the ending a complete disappointment. So much so that I actually re-read the last couple of pages wondering if I'd missed something due to the late hour and my skim reading the overly descriptive narrative. 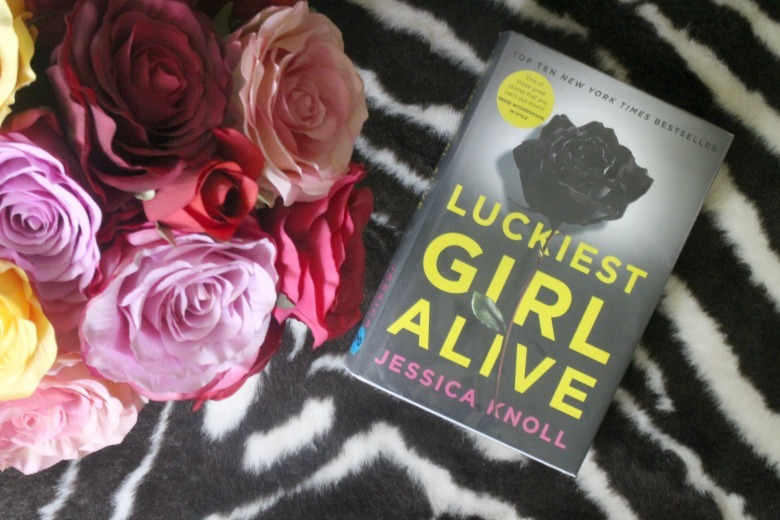 Luckiest Girl Alive by Jessica Knoll is on the New York Times best seller list and Reese Witherspoon has optioned it for a film, and I'm not entirely sure why. When a documentary producer invites Ani to tell her side of the chilling and violet incident that took place when she was a teenager at the prestigious Bradley school, she hopes it will be an opportunity to prove how far she's turned her life around since then. She'll even let the production company film her lavish wedding, the final step in her transformation. But as the wedding and filming converge, Ani's past threatens to come back and haunt her. And as her immaculate veneer starts to crack, she is forced to question: will breaking her silence destroy all that she has worked for - or, will it at long last, set Ani free? Sounds intriguing doesn't it and all the reviews suggest it's a page turner so why was I disappointed? Please note whilst I won't provide any intentional spoilers some elements of my review may allow you to make assumptions about the story. Starting out it felt very 'Devil Wear's Prada' TifAni, or Ani as she is now known works for a fancy New York magazine, projecting a perfect image whilst planning a wedding to her blue blooded fiance Luke. It starts with a few suggestive thoughts that perhaps Ani is the villain, is she a likable character or has she simply been through such a trauma that it has 'made her this way' - what is she hiding from yet prepared to participate in a documentary about? Initially I wasn't sure whether I was meant to like or dislike Ani, and certainly the characters surrounding her were not shown in a positive light either, that much like Gone Girl I found myself switching off with indifference. I kept reading as I wondered was this cast of unpleasant characters to make you like Ani more, or at best understand her? I don't know but by the end I still didn't feel absolved or sure how I felt. It's a very timely tale, especially as we see how Amber Heard is currently being victimised in the press, and this is the story of a 14 year old girls struggles to fit in. Less serious but still topical you can align the current trend of bloggers 'living the high life' and the need to project a positive image and fit in at all costs with Ani's struggles at a school filled with wealthy students. Of course I was as intrigued to know 'what actually happened' that I kept turning the pages and whilst the incident(s) were dreadful I felt that the already mentioned overly descriptive nature of the book meant that these were surrounded by so many other details they were diluted. On one hand the incidents were black and white but again, the details of everything else meant I was almost confused. Constantly I was wondering how does this fit in, is it relevant, who is that person again without actually coming to any conclusion. Additional characters appeared to feature only to pad out the story and add another thread to the tale without having any real purpose and as I've already said the ending... well I was simply 'is that it'. Was Ani happy with the resolution? I believe so and there was some justice but I felt it lacked the impact it should have. Whilst I might not perhaps have inclined you to reach for this book I'd love to know if you have indeed read it and what you thought. I don't think I sold it very well did I! It's a shame you didn't like it. I've seen so many people loving it and I had big hopes for it.